The main requirement of clothing is convenience. It certainly should be considered when modeling clothes for children. Products model mostly in sporty style. Play, sport, leisure - that is the situation where you need clothes. It is desirable to combine colors choosing a beautiful, upbeat sets. Summer elegant girls clothing uses elements of various styles, but the main is the romantic style, i.e. the use of fabrics in soft shades with a decorated ruched, ruffles, ribbons, etc. Silhouettes clothing for children, repeat the silhouettes of adult clothing. The main should be considered the straight and trapezoid. And clothing the shoulder line somewhat extended, has a soft rounded shape. 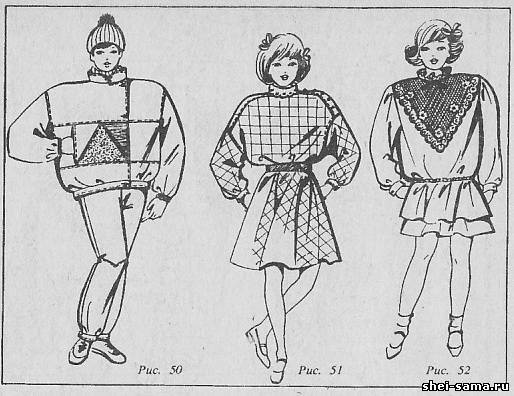 A variety of sleeve: set-in Raglan and low armholes, shirt dresses and blouses with gathered head. The design of the neck is different. Dresses and blouses may be collarless, with a variety of pattern cut - quads, boat, oval.In street clothes and in the selection of jackets collars complex forms - front with hard padding and without it, large rounded collars, collar stand, hoods, often with a placket, buttons, PATA. This allows you to wear them in different ways, depending on the weather and environment. The waist line in the upper group products - coats and jackets - is detected very rarely. But in the light clothing she emphasizes in a natural place, or just above various cut lines or belt. Clasps can be simple or complicated - on the zippers, the buttons, less buttons.Offered fastener asymmetric, concealed or pokrainini the cover. In all types of infant clothing mandatory detail pockets. Depending on the style and variety they come in different forms. A particularly interesting and varied pockets in the products of sporty style: with different location of the entrance, with a variety of fasteners, from fabrics of contrasting textures and colors. Offers fashion and pockets bulk: envelope, briefcase, bag. The length of the products can be different and depends on the range, style, clothing, age. Along with a short fashion of the last years offers more than a considerable length, especially in products, has been solved in the romantic style. In clothing there is the business of the group (children of school age has a special form). Therefore, it is commonly divided into daily, including clothing for leisure, and elegant. In clothing, as in youth, major changes in fashion occurred in connection with a job change. A new trendy range is Besplatnie coats, jackets, raincoats, coats, jackets, vests, coveralls and overalls, dresses, pants in different lengths and shapes (Bermudas, shorts, culottes, socks), skirts and divided skirts, blouses and sundresses. Off-season products, quilted on the insulation can be made from unconventional fabrics for clothing: cotton, staple, thick cotton. 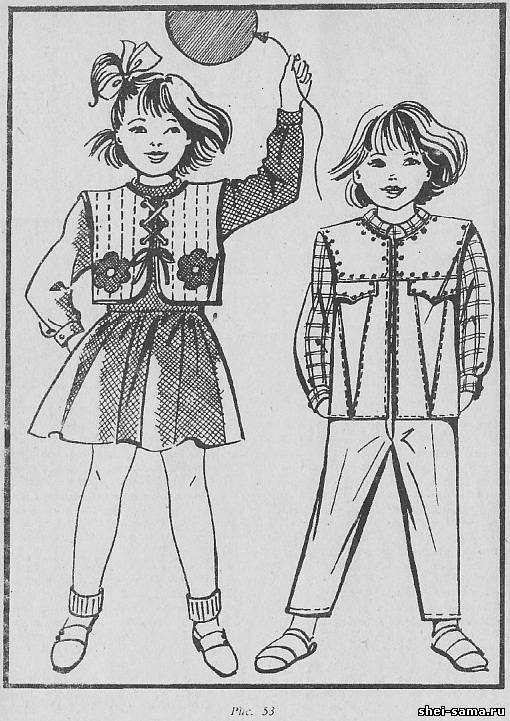 The most convenient kind of clothing for kids are a jacket (Fig. 46, 47, 50). They can be sewn from different fabrics depending on season and destination. Details, the comfortable, sporty style. As finish using edges, lines, zippers, cords, contrasting in texture and color. Popular children's clothes are jumpsuits and overalls. Forms always available, which creates ease of movement. (Fig. 48, 49). Dresses for girls are varied in form and style. Traditional casual dresses can be trapezoidal silhouette with white or lace collars (Fig. 51). Offers and new dresses; dresses-sweaters, tunic dresses, dress-suits, dress shirts, dress blouses. The distinctive feature of elegant and summer dresses there are various kind of decoration: ruffles, lace, ruffles (Fig. 52). Interesting clothing for kids are vests. They have various solutions depending on the purpose and material used. Jackets short, quilted, folk style can be a warming addition to any kit. Offered vests are a classic style with various additions. They can be from a variety of materials: artificial leather, velvet, wool and silk fabrics, quilted with a variety of finishes - suitable piping, with Velcro buttons, buckles, lace-up (Fig. 53). In fashion pants long or cropped. Most fashionable can be considered pants to mid-calf and knee-length. Still popular in clothing for children remain shorts. 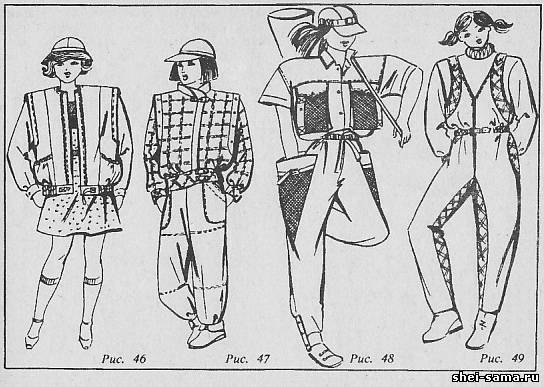 Often pants with bibs or overalls zelenolistnye. Skirts for girls also can be varied in form - in the crease, in an Assembly, group pleats, casual, flared, double layered skirt-pants. For older girls it is possible to offer the skirt straight and short or very wide. Casual blouse loose form. They can be made of different - color fabrics. Dressed in jeans uses lightweight cotton fabric, lace, ruffles, flounces, embroidery. To engraft good taste the children have from an early age. Beautiful and comfortable clothing is one of the elements of culture.